Hear Stiletto Brass Quintet on The American Sound, 6 p.m. Saturday and 7 p.m. Tuesday, on Classical 101. "I think there are some assumptions about the ability of a female brass player versus a male brass player," said Stiletto Brass Quintet hornist Misty Tolle, in a recent phone interview, "and that when you walk in as a woman, part of what you walk in with is this knowledge that you have to be that much better than the person that you’re competing against if they are a man." Assumptions like this one are what the all-female Stiletto Brass Quintet is helping to dispel by simply existing—by being a professional women’s brass ensemble that reaches school-age and adult audiences with music ranging from classical to jazz and beyond. This week join me for The American Sound to hear Stiletto Brass Quintet perform a selection from the first new work specially composed for the ensemble, Drew Bonner’s Scarpe!—Italian for "shoes"—6 p.m. Saturday, March 11 and 7 p.m. Tuesday, March 14 on Classical 101. Above: Stiletto Brass Quintet performs Libby Larsen’s Brazen Overture at the 2013 National Trumpet Competition at George Mason University. Stiletto Brass Quintet came about through friendships formed in two other all-women’s brass ensembles. Trumpeter Amy Gilreath and tubist Velvet Brown played together in the 1990s in the Velvet Brass, an ensemble that eventually disbanded when the members’ careers started to go in different directions. For the next few years, Gilreath and Brown talked about forming a brass quintet together. Then they met up to perform with the Monarch Brass over a single weekend at the International Women’s Brass Conference. "And we went, 'Gosh, we really miss this. We need to put a group back together,' " Gilreath said. "Finally getting back together and she and I performing together again just really solidified that we had to have another brass quintet." Gilreath and Brown didn’t set out specifically to establish an all-women’s ensemble. But after auditioning other musicians as candidates for the three other positions in the group, Stiletto Brass Quintet was formed with a completely female membership in 2010. Since then, the group has embraced a broad repertoire that includes classical works and quintet transcriptions of jazz standards, as well as commissioned new works. "We like to appeal to all types of audiences," Tolle said. "You don't have to wait until the second half of our program to get to some of the lighter fare, but it’s interspersed from the very beginning of the show." The Stiletto Brass musicians also offer a similar variety of music during their in-school concerts, which engage students from kindergarten through high school. "One of the things that’s a very powerful mission for us is to give back to younger audiences. It’s very important to us that we build the next generation of music lovers," Gilreath said. "And there’s nothing more satisfying than when you have a 5-year-old come up to you with tears in their eyes and say, 'That really slow piece that you just played for us was so beautiful. Thank you.' That sums everything up right there." Equally importantly, Stiletto Brass Quintet’s in-school performances also show young audiences, and especially young girls, that playing brass instruments—still a male-dominated endeavor—is something everyone can do. "When we’re going into schools as five women, and one of us an African-American woman, playing these instruments, we’re immediately saying to students, 'This is for you,' " Tolle said. "It doesn’t matter your gender; it doesn’t matter your race; it doesn’t matter your backgrounds.' There isn’t this invisible curtain between us and you that says, 'Yes, come and enjoy this, but it’s not something that you can actually do.' "
Throughout the month of March, Classical 101 celebrates National Women’s History Month with Women of Brass, a series exploring all-female brass ensembles and the work of their pioneering founders. Listen to The American Sound at 6 p.m. Saturdays and 7 p.m. Tuesdays to hear performances by some of today’s most enterprising women’s brass groups. That’s the question that inspired trumpeter Mary Elizabeth Bowden to start the all-women’s brass ensemble Seraph Brass. 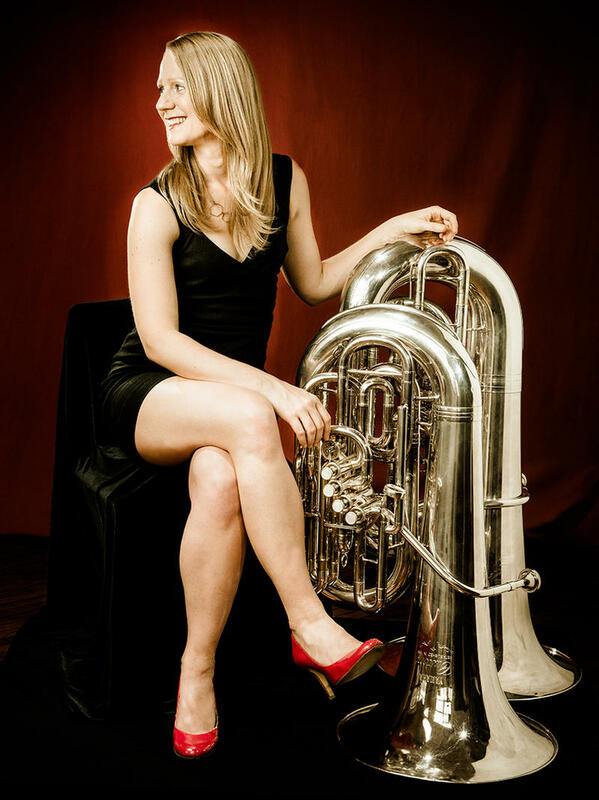 Ask Carol Jantsch, principal tuba player with the Philadelphia Orchestra and the first woman ever to hold the tuba position with a major orchestra, if anyone during the early years of her tuba studies ever discouraged her from playing the tuba because she was a girl, and her answer might surprise you.